This application is 100% Freeware from Bitsum. DiskCacheMgr is a software that allows for controlling disk device write cache policies in a convenient way. Additionally, it provides a quick overview of disk write cache characteristics of particular devices and is capable of toggling the policies known as ‘Enable disk write caching’ and ‘Disable disk write cache flushing’. The software is in alpha development stage, and it is recommended that users not change settings they are uncertain about. In certain scenarios, one might choose certainty of data write request completion over write speed. Disk write cache maintains write fluency by grouping write requests until they can be delegated to a slower device (i.e. hard disk) later. The first setting, ‘Enable disk write caching’, determines whether or not to use built-in system write cache. With disk write cache on, the overall performance may be better, but it comes at the expense of safety: if a power outage occurs and the device is not equipped with a backup power supply, data corruption or loss is likely to occur. With disk write cache off, write requests are passed to the device without caching (on the OS side). In such case, there is less chance of data integrity violation, because the data goes straight to the hard drive (but is not necessarily written immediately). On the other hand, it may be slower because of lack of clever request dispatching. Another type of cache is an internal hard drive cache. Modern hard drive circuitry often includes separate RAM module which can also serve as a cache. The second policy, ‘Disable disk write cache flushing’, defines whether or not the operating system should force the hard drive to flush its internal cache, so that the data gets written and the device signals the fact of having acted upon the demand. If this policy is on, it means that the operating system will not care whether or not the device has flushed its internal cache. One may achieve better performance, at the severe expense of safety. 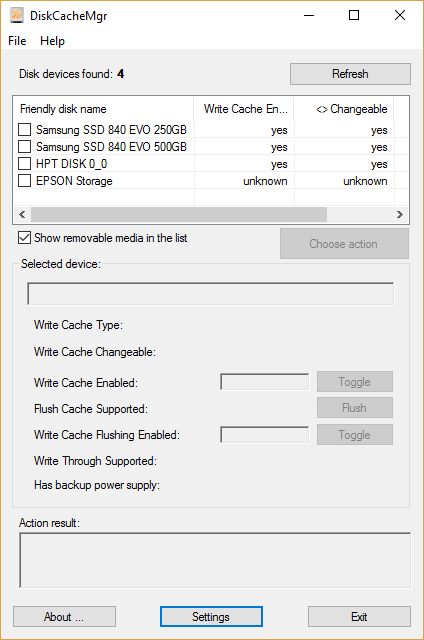 It is not recommended to turn this policy on, unless the device has got a dedicated power supply which would allow the disk to flush its cache after a power loss has occurred. WARNING: This is an ALPHA version, for testing only! Freeware from Bitsum. The primary author of this application is Michal Hanebach.